Good news. I’ve found the motherlode of celebrity recipes. As you may remember, I recently made Frank Oz’s Glop. Horrible name, great recipe. But today I found a website that is all celebrity recipes, all the time. It’s called Silver Screen Suppers, and it is delightful. 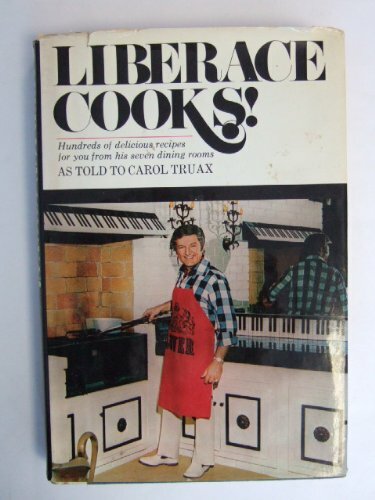 I came across it while hunting down recipes from Liberace Cooks!, the pianist’s infamous cookbook. Silver Screen Suppers posted Liberace’s recipe for baked eggs. If you eat this for breakfast you will likely die. I made his 15-Minute Eggs this morning and I barely survived it. Baked eggs are a great idea in theory though, so I just found a more reasonable recipe for them. It uses half the cream and a fraction of the butter, but still feels incredibly decadent. So, for everybody’s sake, let’s just slide Liberace’s recipe back behind the candelabra. This is the great Liberace’s recipe for 15 minute eggs. It’s a classic breakfast with only 2g net carbs. 1. Heat oven to 425° degrees F, and coat a 4 – ounce ramekin with the butter. 2. Place 2 tablespoons cream in the ramekin, and then crack 2 eggs on top. Sprinkle with parmesan cheese, salt and pepper. 3. Bake 10 to 12 bake until the whites are set, 10-12 minutes. 4. Sprinkle with parsley and serve immediately. Liberace’s recipe is so funny. I tried the second one though and it was good. Thanks for posting. Sure thing. His house was really something.